Sheraw Designs’ Chad Sheraw instructs STEP interns on sanding a mahogany cutting board. Local businesses and Island Therapy Solutions have teamed up to build independence and essential life skills for adults with autism. 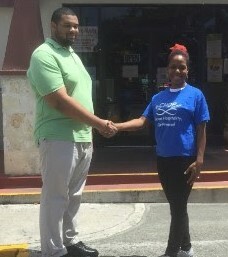 Big Beard’s Adventure Tours, CHOP Grill & Restaurant, Rehab Services of St. Croix, Sheraw Designs and St. Croix Environmental Association recently hosted interns as part of Island Therapy Solutions’ Strategic Transition Enrichment Program (STEP). STEP is part of Island Therapy Solutions’ Applied Behavior Analysis Therapy program for adults with autism spectrum disorder. Each internship operates under an agreement that requires adherence to internship parameters established by the V.I. Department of Labor. The internships typically last about eight weeks, and the interns are accompanied at all times by a behavior technician or a registered behavior technician from Island Therapy Solutions. STEP and similar programs across the U.S. open doors previously closed to adults with disabilities, and consumers appreciate these businesses, according to Autism Speaks, a global autism awareness organization. 2. CHOP & Grill Restaurant Owner Sana Joseph Smith poses with a STEP intern. In a recent consumer study cited on www.autismspeaks.org, 92 percent of Americans view companies hiring people with disabilities more favorably than those that do not. The study also found 87 percent would prefer to give their business to companies who hire people with disabilities. However, that’s not the prime motivator for most business partners. In addition to developing workplace skills and experience, the STEP participants complete projects and tasks designed to develop independent living and social skills. Individuals work on cooking, identifying and managing currency, personal privacy concerns, community safety and other life skills that foster independence. Each participant is assessed to determine the skills developed within their individualized STEP program. Every participant works on tasks designed to meet the specific needs of the participant. To be eligible for STEP, an individual must have a diagnosis of an autism spectrum disorder. 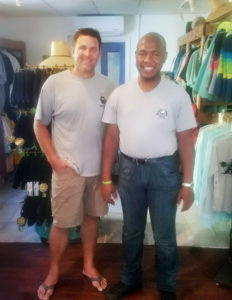 Island Therapy Solutions provides these diagnostic services and offers STEP from its Gallows Bay offices on St. Croix.
. Big Beard’s Adventure Tours Owner Captain Steve Kammerzelt works with a STEP intern. “We are actively seeking partnerships with local business owners to assist in our goal of providing opportunities to develop real-life, day-to-day work and life skills for our STEP participants,” said Courtney Mills, who in conjunction with a board-certified behavior analyst leads STEP. 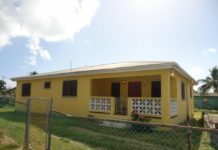 Island Therapy Solutions is a multi-dimensional practice serving St. Croix, St. Thomas and St. John. It provides psychological testing for adults and children, individual and group therapy, psychiatric care, couples therapy, family therapy, ABA autism services for children and adults, occupational therapy for children, and speech and academic tutoring services. Does the same company provide the job and the job coach/RBT at the same time? Sorry I misunderstood, it looks that there are different companies, great opportunity! !